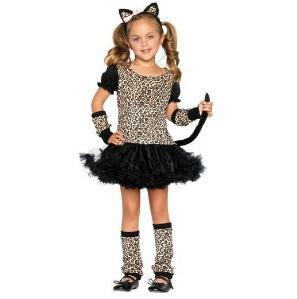 If you have a wild child we bet she would love to wear the Child’s Little Leopard Costume. Frisky and playful are a purr…fect combination for this quality Halloween costume that comes with 5 pieces. The dress features a leopard print top with a black tulle tutu and a long black tail. The costume also features leopard printed arm cuffs and leg warmers. Since every good kitty needs a furry set of ears we have included them as well. You can accessorize this costume further with warm black tights and leopard makeup. We have easy to apply make up kits that will make this costume extra special.